When I finished school, traveling and training in the USA became one of my biggest goals. And I finally made it happen. It probably doesn’t sound as magical for Americans who already live in the States, but for all of us foreigners, I know it could mean a lot—especially for those who are into mixed martial arts. Everyone knows that MMA is very popular in the USA, probably more so there than anywhere else in the whole world. We always watched UFC and other fights from popular MMA organizations and always dreamed to be and train together with all those UFC stars that we see on TV. I was always following Lyoto Machida’s fights because of my Shotokan Karate background, and I always wanted to learn to adapt my karate skills in MMA fights the same way Lyoto Machida did. I wasn’t as excited about training at any other gym, because I was worried that not every coach believed in the effectiveness of this fighting style, and some of them even tried to change me. That’s why I thought that Black House—where Lyoto Machida trains—would be perfect for me, as their coaches are already familiar with this style of martial arts. Once I started following the Black House team, I found out that there are even more Shotokan fighters such as Lyoto’s brother, Chinzo Machida, and The Ultimate Fighter Brazil Season 3 finalist, Marcio “Lyoto” Alexandre, who got his nickname because of his chosen fighting style. Because of these things, I knew this was the place where I needed to be; this is my goal. I started working hard to save up enough money for this trip, and to turn my dreams into reality. It might be just a coincidence or it might be a destiny, but it so happens that my best friend lived in L.A. where Black House is located, so I got another reason to make the trip—because I really wanted to visit him, too. If not for him, I don’t know if I would have been able to make this trip happen in the first place. He helped me a lot with planning and preparing for it. I put all my effort into working hard and saving up enough money for this journey. Once I had enough savings, I got my three-month visa, and started contacting Black House. I was naive to think that it would be easy to get there. It obviously wasn’t. It’s a private gym, not open to the public, and there was no chance I could get there on my own. They didn’t display a street address, so I didn’t even know how to find it in case I wanted speak with someone in there personally. I contacted the Redondo Beach Black House gym manager, Marinho Masi. I told him that I was interested in training full time at their gym. It took almost two weeks until I received a response, but when I did, it was very good news: They not only invited me to train at their gym, but they also offered to allow me to stay in their accommodations for fighters. I accepted the offer without even thinking twice; it was all I had wanted my whole life. “Live and train in the same building with other fighters? That’s awesome! I’m in!” – I said. That’s how my journey began. I’m not going to bother you with all the details of the traveling itself and my first impressions of L.A. too much, but to me it was something magical and significant. I loved everything about it. If there is a place in the world where I want to live right now, it’s definitely California. It’s even hard to describe in words that feeling when you leave the airport and enter to the city, and you know: this is it, the city of your dreams. You have to experience that yourself, wherever your dream destination might be. It was 10 a.m. on Monday morning when I arrived at the gym. Marinho Masi (everyone calls him Mario) was waiting for me; he was cleaning the room to make sure it was tidy for my arrival. I felt really welcomed in there. Mario was one of the friendliest and the most caring people I met in L.A. He was always concerned with how I liked living there, if I felt comfortable, if I liked my room, etc. He was in the gym almost all the time and I could just jump in to his office whenever I needed anything, or even just for a chat about sports, or about Europe, as he likes to travel a lot. My room was kind of cozy. Even though it had two bunk beds, I was the only one who lived there during my first week. The second week I got a roommate—Sheymon Moraes from Brazil, who is fighting for the MMA World Series of Fighting bantamweight world championship belt on August 1. There were two other bedrooms, small kitchen, a shower room and two bathrooms. The mat area was just about 20 feet away from my bedroom door. It had a lot of space and a few punching bags. I loved to be so close to the mat, having that ability to just wake up in the morning and go over to the mat to work some drills or punch the heavy bag. My other housemates were also Brazilian fighters: William “Patolino” Macario, Alexandre Pantoja, Vitor Oristanio, Marcio Alexandre, Jr., and other guys. Some fighters were just coming for a couple of weeks to train and would be leaving the house afterward. There was also a BJJ coach, Sanderson Dantas, who was staying with us. He is definitely one of the craziest guys in the gym, and he made living there and training there really fun. My housemates from the left: Márcio Alexandre Jr (Lyoto)., William Patolino Macário, me, Marcel Vianna, Alexandre Pantoja and Sheymon Moraes. 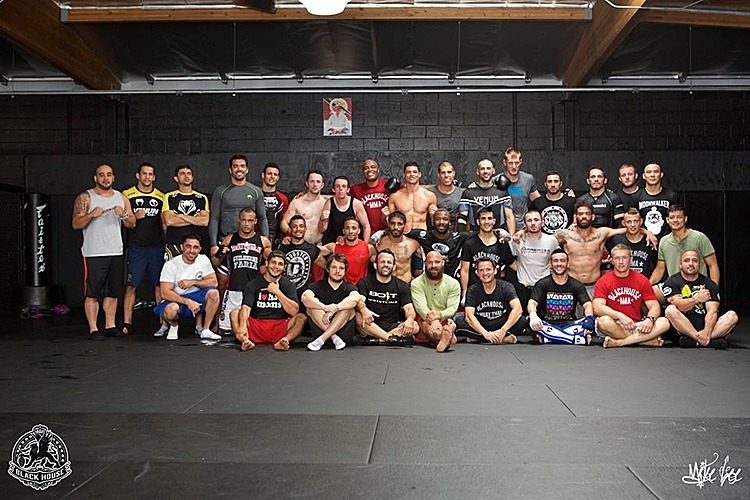 It was really an awesome feeling staying together with all those professional fighters, who currently hold belts in different MMA organizations and some of them fight in the UFC. Plus, I had an opportunity to get to know a different culture. I’ve learned that Brazilians are very friendly, easygoing and sometimes a little bit crazy. Seeing them all day, every day, all happy, made me want to be like them. I only wish I knew Portuguese. Although they all spoke English, some were better and some were worse, but we could all understand each other. I joined the training from the very first day. I was motivated to make these three months as my opportunity to be a part of the best training camp I’ve ever had, to reap the most knowledge and experience possible from it, and to become a better fighter and martial artist than I was before. For the first couple of weeks, I was literally living on the mat, taking 4-5 classes a day. But two weeks later I had to slow down, as I injured my back. I realized that if I continued to train like this, I had the potential to become even more severely injured. But it was hard to resist—every training class was so interesting that I just didn’t want to miss a single one. Wrestling classes were taught by Kenny Johnson, who also teaches at the main Black House gym. He’s a former wrestler and MMA fighter, but most importantly, he’s a great coach. Wrestling for me was a new thing, although I had done some Judo and BJJ in the past, so I didn’t have a lot of trouble picking new wrestling moves. And I really wanted to learn it. After wrestling class, I would go straight to BJJ. It was led by Luiz Panza (and Sanderson Dantas while Panza was injured). They are both top-level coaches and current competitors in high-rank BJJ competitions. They taught me a lot, and I’m very grateful for these guys. After BJJ class was karate class with Chinzo Machida. There was no way I could let myself skip it. I was very excited to see how the Machida family had adapted Shotokan for MMA and real-life, self-defense situations, so I didn’t even think about how tired I was—I went to class. Attending those classes was well worth my effort. Chinzo recognized my skills pretty quickly, but it had been a few years since I’d done karate, so I needed to work on a lot of things. With Chinzo’s help and support, I was able to polish my technique pretty quickly. I got comfortable again, and started utilizing various Shotokan combinations later when I was sparring in MMA and Muay Thai classes. 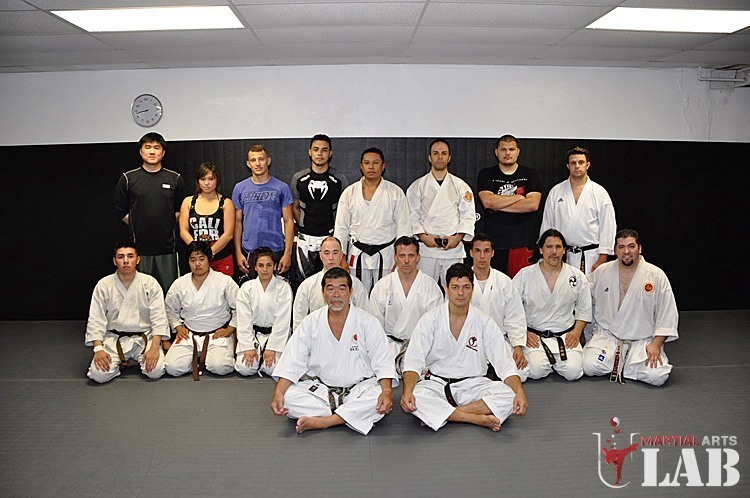 Muay Thai and MMA classes were taught by Howard LaCroix. Sometimes, Muay Thai classes were held by some of the professional fighters from Brazil who were staying at the house. So it was really nice to learn different techniques (or the same techniques from a different person). While I was training there, my housemates were resting after their classes in the Black House, sitting on the couch to the side of the mat area, and watching us in our classes, sometimes jumping in for Jiu-Jitsu to roll with us. One day, after the classes were over, we were having a chat and they said: “Bro, you’re a good fighter; you should go with us to the old Black House.” I was thrilled. I couldn’t hold back my smile when I heard this. They not only admitted that I’m good fighter, I was also invited to the Black House—which up to that point, I had only dreamed of. I would never thought that it could happen so quickly. So, once my back got better I started to go to the main Black House every morning to train together with my house mates. So here I was, entering the Black House, shaking hands with all those guys that I only saw on TV or social media. Everyone was super friendly, no egos or anything. It felt so good that I feel like my smile is about to break my face. Everything around—the walls, mat, cage, ring—was black (like you would assume from the name of the place), and it looked super awesome. My housemate, Marcio Lyoto, asks Kenny Johnson (Kenny is one of the main coaches at the Black House, who teaches wrestling) about me and if they are okay for me to join the class, and Kenny says: “Sure, I know this guy, he comes to my wrestling classes.” Now I want to just jump in the air like a kid. But I pretend that I’m cool. Besides Kenny, there was another coach, Daniel Woirin. He is the main coach of the striking classes. It seemed like both Kenny and Daniel really loved their jobs; they were always there to help, to correct us, and were always happy to answer our questions and explain the techniques whenever we were struggling to get it right. Their support was unwavering. The hardest training I’ve ever had in my life was the training I did with Black House, especially the wrestling, striking and sparring classes. I have my purple belt in BJJ, and I have been training in various other martial arts (including karate, Muay Thai, and boxing) since I was 7 years old. I was always comfortable with my conditioning and my technique; I had wrestled with many high-level BJJ guys before—but the training in Black House was just on a whole other level. Every single partner I paired up with was tough. Usually, in the other gyms where I used to train, we had a few tough guys that offered a real challenge when sparring with them. However, when you’d switch partners and end up with someone who wasn’t at that high level, you could afford to relax and go easy on him and rest. In Black House, there was not a single moment where I could rest during any of the sparring I did. If you dropped your hands, you’d get hit—and if you got him, you might get knocked down. It was the same way with wrestling: if you relaxed too much, you’d end up losing the position or getting submitted. So, the intensity of the training was really huge. And I loved it. I loved being tired after class, I even loved being dominated by other fighters. It made me realize that there are no limits to how good you can become if you train hard. I felt like I was improving with every class—and that’s the best feeling in the world. Just when I thought that I couldn’t be happier with my life, I suddenly injured my neck. It was just a quick snap down, but it made me unable to turn my head at all or even sleep for a few days. I decided to rest and recuperate, foregoing training for a week until the injury healed. After a week had passed, I began to feel somewhat better, so I started running and working on striking drills and shadow boxing. My BJJ coach, Sanderson Dantas, was taking me to the UFC gym, where I was lifting weights in an effort to speed along my recovery. At the end of the week, I decided that I felt better and could go to sparring class at the Black House. But it wasn’t very smart choice. Even though I didn’t feel anything during the sparring, after that class, when my body cooled down, my injury became even worse than it had been before. I went to the chiropractor to get an x-ray and found out that it was an old injury involving nerve damage in the spine. I got the chiropractic adjustment, and although it helped a little, I still couldn’t wrestle for more than a month afterward. But I couldn’t accept the doctor’s advice to rest completely. I was going to be in L.A. for less than three months, and who knew when I would be able to come back here again? I couldn’t afford to waste such an opportunity to train in the Black House. So, I still took striking classes for a while, and later joined BJJ classes just to do some techniques. Unfortunately, I couldn’t spar or do anything that caused more severity in my pain or that could make my injury worse. Regardless of my injury, I’m more than happy with my trip to L.A., and I have no regrets. It was definitely the best holiday—and training camp—I’ve ever experienced in my life. In the final week before I left, my neck felt a little bit better, so I went to sparring class again. It was the most crowded class ever, where we had bunch of UFC starts taking the class too. It was a pleasure and an honor to be there together with them. It’s still hard to believe that one of my dreams just came true. But it made me realize that it’s just the beginning, and that everything is achievable when you really want something and put in all of your effort to make it happen. I believe that I’ve not only become a stronger and more technical fighter, but also more knowledgeable and wiser as a person. It was a huge experience, and one that I’ll remember for my whole life. Thank you to all the people who were together and helped me during this camp. Even though I was sad to leave L.A., I knew with 100 percent certainty that I’d be coming back soon. I’m still young, and I like to travel a lot. I still want to visit more countries, interact with more different cultures, and learn different martial arts. I’ve had some thoughts about Thailand or maybe some other countries before I head back to L.A. I can’t wait to see where life takes me next! super interesting story, thanks :). Good luck in your future endeavors!. Most #HumbleFighters #BlackHouse honor to know! !